Never Enough Nails: 4 Free Zoya Polishes!!! Nab this deal!! 4 Free Zoya Polishes!!! Nab this deal!! Start your year off on a colorful note with NEW, toxin-free shades. We’re making it extra easy for you to get a head start on your resolutions by switching to a healthier, BIG5FREE formula… you can pick ANY 4 colors to receive FREE – just pay promotional shipping. The hardest choice you’ll make all year is which 4 colors to choose! 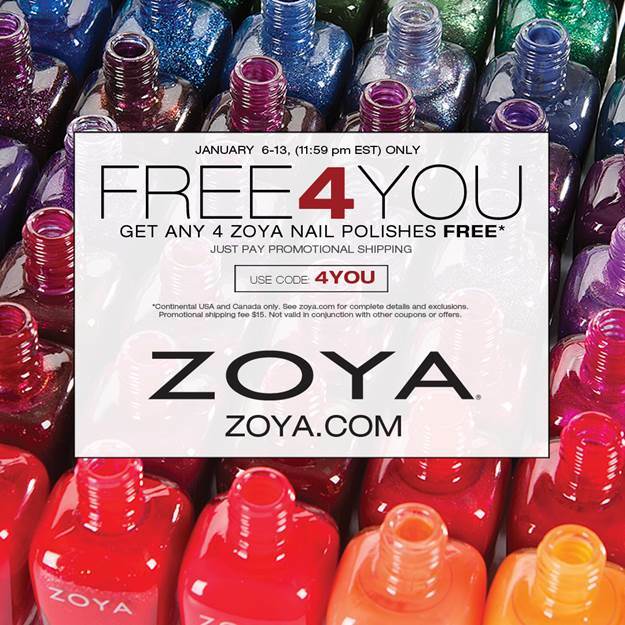 Valid online only at www.zoya.com through 1/13/15 (11:59pm EST). Excludes pre-packed items, Naked Manicure, Zoya Treatments and the Spring Whispers Collection shades. Promotional shipping fee $15. Not valid in conjunction with other coupons, codes or promotions. Continental US & Canada ONLY. International processing fee applies for orders outside the US. Art of Beauty is not responsible for incorrect addresses, credit card entry errors, web related issues or any errors associated with declined credit cards. Returns or exchanges of promotional items not permitted. Code must be entered at time of purchase - code cannot be reinstated on canceled orders. Please allow up to 4 weeks for processing if volume warrants it. OPI Hello Kitty Collection, Part 2! OPI Hello Kitty Swatches, Part 1!! Recent Smitten Polish Purchases and Smitten News! OPI New Orleans Spring 2016 Preview!! Zoya Whispers Collection Swatches & Review! First Lynnderella Friday of 2016! !